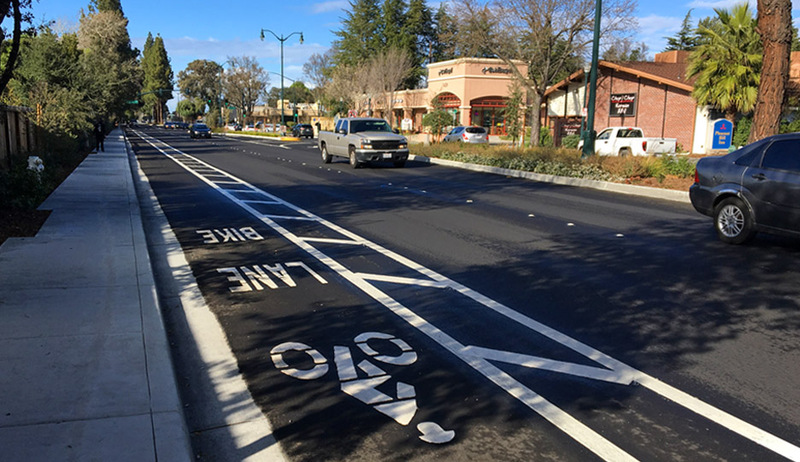 Funded through the Federal Highway Safety Improvement Program, this project will introduce pedestrian and cyclist safety enhancements consistent with Complete Streets principles to Contra Costa Boulevard, the busiest northsouth thoroughfare in Pleasant Hill. The project will extend a reduced vehicle travel way (down to two lanes in each direction); add new Class 2 bicycle lanes in each direction; improve pedestrian facilities and widen sidewalks; add accessible paths of travel; install new roadway and pedestrian- scale lighting; enhance the streetscape and improve median landscaping; and a modify the existing traffic signal at Ellinwood Drive to comply with the latest safety and accessibility standards. CHS Consulting Group is responsible for traffic signal modification at the intersection of Contra Costa Boulevard and Ellinwood Drive, and street lighting analysis and design along the corridor. Features include accessible pedestrian actuation, bicycle detection, and pedestrian scale lighting. Designs are consistent with Accessible Pedestrian Facilities Design Guidelines. CHS also performed traffic operations analysis to support the project for NEPA environmental clearance and federal funding.